This Amsco 8816 is a real work horse. 9" square chamber. So much can be fitted in there. Unfortunetely it is no longer being manufactured. However, sometimes we may have one of these autoclave available as a used one. Call to see if we have any. 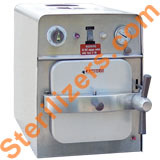 If you have this sterilizer, and it does not work, we can rebuild it for you for $895.00 which will include one (1) year warranty for parts and labor. You are welcome to call for availabilty and price.